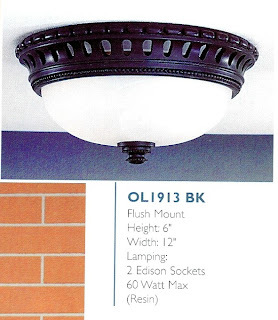 This one is an indoor/outdoor flush mount by Murray Feiss, model number OL1913BK. It's from their Castle Collection, in a black finish, with white glass. It is 12" wide by 6" high and takes two 60-watt lamps. The regular price was $85.50, but it is now marked down to $45. What a bargain!